No Crude Oil in Grays Harbor! It’s official! The Port of Grays Harbor finally confirmed that crude oil terminals are no longer on the table. When the fight began just a couple of years ago, there were three proposals in Grays Harbor. Now there are ZERO. This took all of us working together through the Stand Up To Oil coalition. While our coast is now protected from these types of projects, Washington still faces a major threat from another proposal: the Tesoro Savage oil terminal in Vancouver, on the shores of the Columbia River. This fall, we expect a final decision on this project, and we’ll keep you up to date on how you can help to stop the largest crude oil terminal in North America. UPDATE: The Washington Supreme Court breathed life into the Ocean Resources Management Act (ORMA), a state law that protects coastal ocean resources, and ruled that the law’s strict permitting requirements apply to crude oil shipping terminals. The ruling will effectively block a proposed crude-by-rail terminal in Hoquiam. Read our press release here. Big Oil wants to bring crude oil into Grays Harbor by rail and then transport it through the Harbor by vessel. This would mean oil trains, tankers, and barges in Grays Harbor daily – putting communities and waterways at risk. Oil trains have derailed across North America with devastating consequences. Explosions will cost lives and oil spills will cost jobs. The City of Hoquiam and Washington Department of Ecology released documents evaluating the risks. We can say no to these projects and yes to protecting our communities! The Final Environmental Impact Statement for the proposed Westway oil terminal has just been released by the Department of Ecology. This statement considered the tens of thousands of comments submitted by concerned people like you! 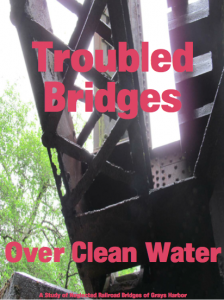 Troubled Bridges over Clean Water: A report detailing the decrepit state of bridges that the crude oil trains would travel over if the Westway proposal is allowed.